To secure geothermal rights and land access or control, a developer needs to determine land and geothermal resource ownership. Unless a developer owns both the surface rights and geothermal rights for a project, the developer will be required to obtain land access from the owner(s) of the surface rights and/or geothermal rights. Even in cases where the developer owns both the surface rights and geothermal rights for a project, the developer may still face land access issues related to accessing the site, and building roads, pipelines or transmission lines for the project. Land access can be gained through land purchase, a lease, or by obtaining written or oral permission from the landowner. Typically, a formal written lease is standard practice for private land, while federal, state, or tribal land may have statutory or regulatory leasing requirements to meet before the relevant party may issue a lease. 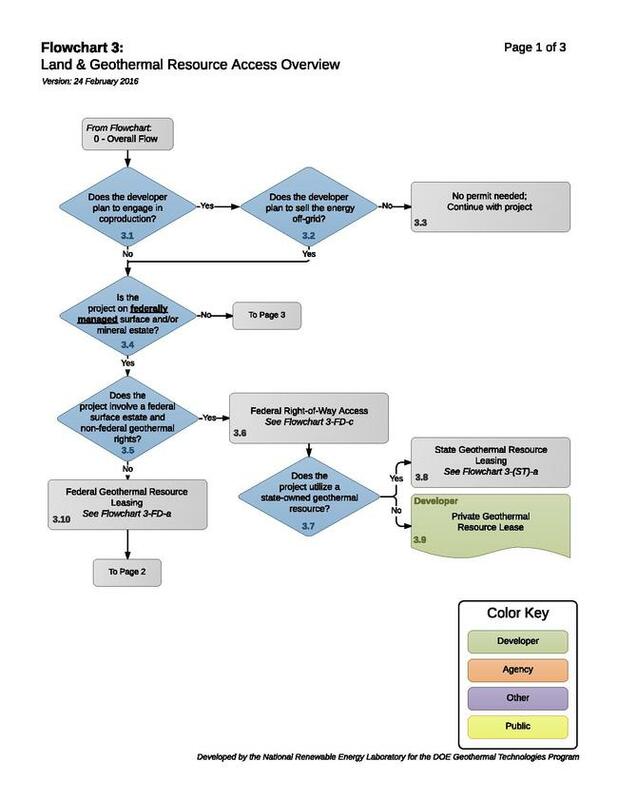 This flowchart presumes a title opinion has already been obtained and the developer has already determined the rights that must be acquired in order to harvest the geothermal resource. 3.1 - Does the Developer Plan To Engage in Coproduction? If the developer plans to engage in coproduction of geothermal resources with oil and gas on the same project site, then the developer may be required to obtain a permit if they intend to sell energy the geothermal energy off-grid. 3.2 to 3.3 - Does the Developer Plan To Sell the Energy Off-Grid? If the developer does not plan to sell energy off-grid, but instead only uses the energy derived from geothermal resources on the project site to assist in the development of oil and gas then no permit is necessary and the project may continue. 3.4 - Is the Project on Federally Managed Surface and/or Mineral Estate? On a federal mineral estate managed by the Bureau of Land Management (BLM), the developer will need to obtain a Geothermal Resource Lease to develop geothermal resources, which is typically obtained from the BLM through the Competitive Geothermal Lease Sale Nomination Process or through a noncompetitive lease application for lands on which no bids were received at a competitive lease sale (the noncompetitive option extends for the two years following the competitive lease sale). The developer may obtain access to the land for certain exploration purposes without a lease with the approval of a Notice of Intent to Conduct Geothermal Resource Exploration Operations. Pursuant to the Geothermal Steam Act of 1970, the Bureau of Land Management leases federal lands and reviews permit applications for geothermal development on those lands. The BLM’s authority encompasses about 570 million acres of BLM land, 193 million acres of National Forest System lands, other federal lands, and private lands where the Federal Government has retained mineral rights. In most locations, BLM is responsible for the management of the federal mineral estate and issues geothermal leases for all lands owned or controlled by the federal government (such as the U.S. Forest Service and Bureau of Reclamation). Some statutory exceptions give this authority to other agencies like the United States Department of Defense, United States Department of Energy, Bureau of Indian Affairs, etc. Contact your local BLM office to see if any exceptions apply to your project location. 3.5 - Does the Project Involve a Federal Surface Estate and Non-Federal Geothermal Rights? In these situations, the surface rights and geothermal rights for a piece of land are owned by different parties. (see BLM Instruction Memorandums: IM 2003-131 Split Estate and IM 2007-021 Split Estate Leasing and Planning). In an instance that involves a federal surface estate and non-federal geothermal rights (i.e., geothermal rights under the control of a state, tribal, or private entity), when BLM or United States Forest Service is the surface management agency (the geothermal rights were not reserved to the Federal government), a special use permit or a right-of-way (ROW) may be required to occupy the surface. The drilling permit will be approved by the appropriate State agency. Contact the local BLM or USFS office for further instruction. A ROW is a special use permit to occupy lands for specific purposes, like transmission lines, access roads, off-lease facility siting, or pipelines. A right-of-way is not required for on-lease activities (usually granted as a lease right), but is required for off lease activities. 3.7 – Does the Project Utilize a State-Owned Geothermal Resource? If the project utilizes state-owned geothermal resources, then the developer must obtain a lease from the state in compliance with applicable laws and regulations. If the project does not utilize a state-owned resource, then the developer must negotiate and obtain a private geothermal resource lease. A geothermal developer may need to obtain a geothermal resource lease in order to develop on state lands. If the project does not utilize a state-owned geothermal resource, then the developer must negotiate a geothermal resource lease with the private owner. Leasing gives a developer the exclusive right to develop and utilize geothermal resources on a given federal site. A lease is required prior to doing all later stage work, and the lease contract specifies terms for development and payment of royalties and rents to the government. Surface rights for approved activities are included in the lease. Stipulations may be placed on leases to protect other resources through mitigation or restrictions on surface use. Congress passed the Energy Policy Act of 2005 (EPAct) amending the Geothermal Steam Act of 1970, requiring that all public lands available for geothermal leasing be offered first by competitive leasing. Lease parcels that receive no bids are then available non-competitively for a period of two years. BLM may issue a non-competitive lease for direct-use only if there is no competitive interest. The maximum competitive lease size is 5,120 acres. The maximum acreage held by an individual/company in a state is 51,200 acres. Lease acreage held by production or committed to a unit agreement are exempt from the state-wide acreage limitation. BLM issues competitive and non-competitive leases for geothermal exploration and development on lands owned or controlled by the federal government. Competitive lease sales must be held at least once every two years in states where nominations are pending. Both are issued for a 10-year period that can be extended for two subsequent five-year periods by completing diligence on the lease hold. When is a lease required? Exploration activities that cause a surface disturbance on federal land require a geothermal lease. Exploration activities that do not penetrate a geothermal reservoir (temperature gradient well, seismic, etc.) are permitted with an approved Notice to Intent Conduct (NOI) exploration and do not require a geothermal lease. The drilling of an exploration well to test a prospective reservoir requires that the applicant for a drilling permit have either a geothermal lease or operating rights. The Geothermal-Biz website presents a brief introduction to geothermal leasing and permitting on federal and state land. The website includes details on leasing terms in western states, including the length of the lease, renewal terms, rentals, royalties and size limitations. Also note Geothermal Leasing 101: Federal, State and Private Lands, a presentation by Andrew T. Braff, Esq., at the Geothermal Resource Council's 33rd Annual Meeting, Reno, NV (October 2, 2009). 3.11 - Does the Project Involve a Non-Federal Surface Estate and Federal Mineral Rights? The BLM's Split-Estate Policy only applies to situations where the surface rights are in private ownership and the rights to development of the mineral resources are publicly held and managed by the Federal government. For a general review of exploration and development in these ownership situations, see the Gold Book on Split Estate (2007). If the project is not on non-federal surface land with federal-owned minerals, then the project may continue without a permit. 3.13 - Will the Project Encroach on a State or Local Highway Right, or State Owned Surface Estate? If the project activity (i.e. pipeline, fences, access roads, etc.) encroaches on a state or local highway, then the developer may need a state highway encroachment permit. See, 3.15 – State Highway Encroachment Permits, below. If the project is located on a state-owned surface estate, then the developer must comply with any applicable state land access rules and permitting requirements. The developer may require land access over a state surface estate for roads or transmission lines. If the project is not on state-owned surface estate, then the developer must work with the surface owner to obtain a surface access agreement. On state land, the access process varies from state to state, in large part due to the inconsistent definition of a geothermal resource and the level of control the state exerts over geothermal resources. To access the geothermal resource, a developer may be required to obtain a state geothermal lease by either competitive or noncompetitive means, a state surface lease, or a temporary permit for exploration activities. Developers may obtain other forms of surface access through a right-of-way, or other use authorization to access state lands. State and local governments require an encroachment permit for any object placed in, over, or under a local or state highway right-of-way (i.e. towers, poles, pipelines, fences, and other structures), as well as when a private access road or driveway joins a public road. On a private surface estate or mineral estate, the developer will be required to negotiate a private lease or easement when the individual landowner. The operator must make a good faith effort to notify the private surface owner before entering private surface to stake a well location and access road or to conduct cultural or biological surveys. Each Geothermal Drilling Permit (GDP), NOS, or Sundry Notice permitting new surface disturbing activities must contain the name, address, telephone number, and e-mail address (if available), of the private surface owner. The BLM will invite the surface owner to participate in the onsite and final reclamation inspections and will take into consideration the needs of the surface owner when reviewing the APD and reclamation plans and when approving final abandonment and reclamation. The BLM will offer the surface owner the same level of surface protection that the BLM provides on Federal surface. The BLM will not apply standards or conditions that exceed those that would normally be applied to Federal surface, even when requested by the surface owner. Prior to approval of the APD (or Sundry Notice to conduct new surface disturbing activities), the operator must certify as part of the complete application that a good faith effort had been made to reach a surface use agreement with the private surface owner and that an agreement was reached or that it failed. Prior to approving the APD, the BLM will advise the surface owner of the right to object to the sufficiency of the bond and will review the value of the bond if the surface owner objects. The BLM will either confirm the current bond amount or establish a new amount. Once the operator has filed an adequate bond, the BLM may approve the APD. Following APD approval, the operator and the surface owner may appeal the BLM’s final decision on the bond amount. The operator must negotiate in good faith with the surface owner. Negotiating in good faith provides a forum through which the operator and surface owner can discuss the preferences and needs of both the surface owner and the operator. In addressing those needs, the operator may be able to modify the development proposal to both minimize damage to the surface owner’s property while reducing reclamation and surface damage costs. For example, operator costs can might be minimized by placing roads and facilities in locations that meet the surface owner’s long-term development plans for the property, thereby lessening the future reclamation obligations of the operator. The surface use agreement between the surface owner and the operator is confidential. However, the APD Surface Use Plan of Operations must contain sufficient detail about any aspects of the agreement necessary for NEPA documentation and to determine that the operations will be in compliance with laws, regulations, Onshore Orders, and agency policies. 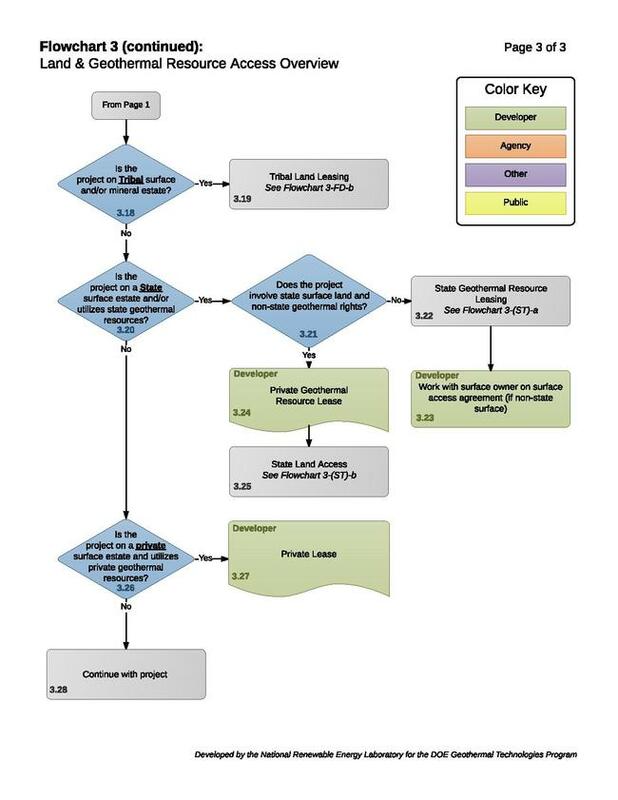 When the operator submits its Surface Use Plan of Operations to the BLM, the operator must make a good faith effort to provide a copy to the surface owner. Following APD approval, the operator must also provide a copy of the Conditions of Approval to the surface owner. 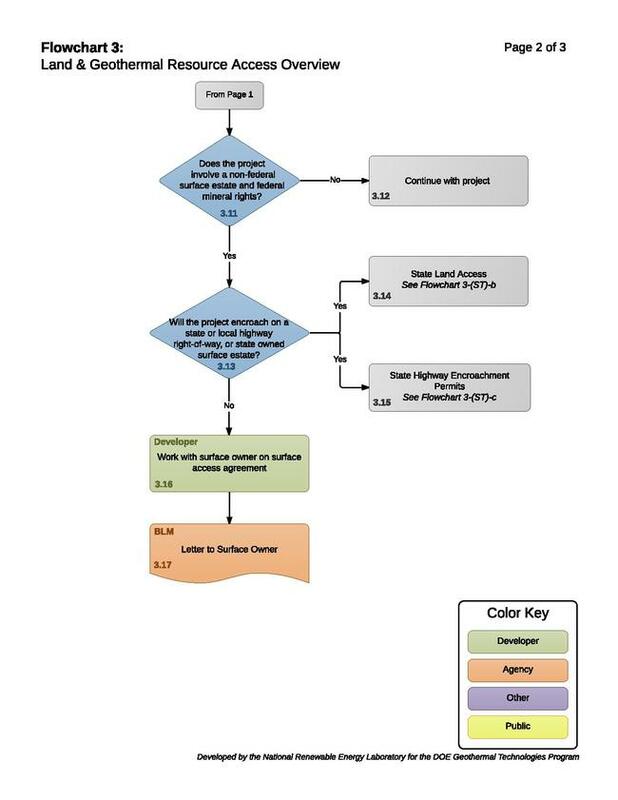 In addition, the operator must make a good faith effort to provide a copy of any proposal involving new surface disturbance to the private surface owner. BLM conducts inspections based on a priority ranking system. If a surface owner detects noncompliance, they should contact the BLM. BLM will investigate and take appropriate enforcement action. The Bureau of Land Management makes an effort to work with the surface owner and sends formal documentation of such efforts in the form of a letter. 3.18 - Is the Project on a Tribal Surface and/or Mineral Estate? On tribal land, the developer will negotiate with the individual tribe for land access, which may require approval from the Bureau of Indian Affairs (BIA). The process will vary depending on whether the developer is seeking access to a surface estate or mineral estate and whether the tribe has been granted the authority to operate without BIA approval by the Secretary of the Interior. The United States has a unique legal and political relationship with Indian tribes and Alaska Native entities as provided by the Constitution of the United States, treaties, court decisions and Federal statutes. Within the government-to-government relationship, BIA provides services directly or through contracts, grants, or compacts to 566 federally recognized tribes with a service population of about 1.9 million American Indian and Alaska Natives. While the role of the BIA has changed significantly in the last three decades in response to a greater emphasis on Indian self-governance and self-determination, Tribes still look to the BIA for a broad spectrum of services. A facility to process or refine energy resources developed on tribal land. A facility located on tribal land that processing or refines energy resources developed on tribal land. For tribes that do not elect to pursue a TERA or for energy resources that are not included in an existing TERA, existing regulatory programs for energy resource development on Indian Lands are available. The Tribal Energy and Environmental Information Clearinghouse has compiled various applicable Laws and Regulations for geothermal energy development on tribal lands specifically. 3.20 - Is the Project on a State Surface and/or Utilize State Geothermal Resources? The individual state lands agency (board) is responsible for the leasing of geothermal resources. 3.21 - Does the Project Involve State Surface Land and Geothermal Rights? If the project is on state-owned surface land and has non-state geothermal, then the developer must obtain a private geothermal resource lease. If the project is not on a state-owned surface estate, but utilizes state geothermal rights, then the developer must go through the state geothermal resource leasing process and work with the private surface owner on a surface access agreement. If the project is on a state-owned surface estate and geothermal right, the developer will likely only need to complete the State Geothermal Resource Leasing process, unless part of the surface estate is managed by another state agency. When a developer is required to comply with state geothermal resource leasing, the developer will also be required to negotiate access to the surface land through an access agreement with the surface owner. If the project is located in an area where the state owns the surface estate and a non-state entity owns the geothermal rights, then the developer is required to negotiate and obtain a private geothermal resource lease from the geothermal owner. 3.26 to 3.28 - Is the Project on Private Surface and Utilizes Private Geothermal Resources? If the project is on a private surface estate and utilizes privately owned geothermal resources, the developer must negotiate a lease with the geothermal resource owner. If the surface estate is owned by another private party, the developer may want to negotiate a surface access agreement with the surface owner. In addition, if the developer will require access over privately held land that does not overly the geothermal right, the developer may need to negotiate additional for land access. This page was last modified on 29 August 2018, at 16:06.